» A Movie Review by Walter Albert: THE UNKNOWN (1927). 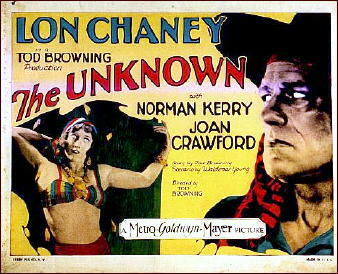 A Movie Review by Walter Albert: THE UNKNOWN (1927). THE UNKNOWN. MGM, 1927. Lon Chaney, Norman Kerry, Joan Crawford, Nick De Ruiz, John George. Director: Tod Browning. One of Lon Chaney’s most famous roles. He plays Alonzo, an armless circus performer, who loves Manon (Joan Crawford), daughter of the circus owner. Alonzo performs prodigious feats with his bare feet and is caressed fondly by Crawford, who cannot bear to be touched by “normal” men. Eventually, Crawford is cured of her neurosis and is happily married to the strongman, who has devised an act where his arms are attached to two horses running in place on treadmills with the mechanism controlled by a single lever in the wings. But you didn’t think I was going to tell you how this one came out, did you? There’s a strangulation, murder, a dwarf, a visit to a hospital operating room at midnight (this is, after all, only four years before Frankenstein), and Chaney’s menacing, brooding presence, like a tightly-wound spring that threatens to unwind at any time. — Reprinted from The MYSTERY FANcier, Vol. 8, No. 4, July-August 1986. 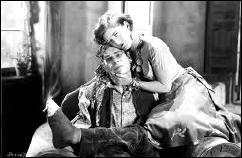 Truly a bizarre film and no surprise that it comes from the master of the macabre, Tod Browning. Way ahead for its time, too. It’s enough to give the faint of heart real nightmares even by today’s standards of horror. You’re right. Browning had a way of showing us exactly what it is that keeps us up at night (and shivers down our backs). I’ve not seen this one, but the way you and Walter describe it, it fits right in with the ones I have seen. As I was browsing through the IMDB credits, I happened to cross over to the Joan Crawford page. I absolutely did not know that she made something like 25 silent films, about a quarter of her resume. She made this one when she was 22. Fascinating information, John, even if a “piece of trivia”… Thanks!